My Journey to Fit: Wednesday Workout Update - Oh, Deer! Wednesday Workout Update - Oh, Deer! We always do a warm up walk before our Saturday run - about half a mile from the park to the intersection, and the same distance back. This past Saturday, as we were almost back to the park, we saw a couple of deer on the grounds of the church that's across from the park. Then, they started bolting across the street, right in front of us - seriously, they were no more than 20 - 25 feet from us - and they just kept coming! It was a stampede of deer and was the coolest thing to witness. There must have been at least 15 of them, and to hear their hooves clattering on the pavement and see them running, full speed, so near us, was a beautiful sight. So the run. I ran with Jeff and CC (Julia was off on a fishing trip with her husband) - the plan was to run for 4 miles, and to run as much as I could without taking a break. We set off and I was doing OK, but I'd somehow changed the display screen on my Garmin, so it wasn't showing my total mileage. Not a big deal, especially since Jeff and CC were keeping track of the miles, but as we kept running, and at a pretty strong pace (for me), I started to struggle mentally and panic, and finally had to stop. They tried so hard to keep me going because they could see how close we were to hitting a 5K (3.1 miles) without me stopping, but I couldn't breathe (anxiety), and had to take a couple minutes to get myself together. As it turned out, we stopped at 2.75 miles, so that's a new record for me. Now, if I could just GET IT TOGETHER and stop feeling so freaking panicked when I run without stopping, that would be just peachy. We finished out the 5K, and then walked for about a quarter mile, and then we started running again. As CC pointed out, physically, I am perfectly capable of running several miles without stopping, because I was doing fine with that additional mile. It's just that blasted mental thing. Frustrating, to say the least. We were never meant to be on Boonville. And it's too bad we didn't take that first green path to the park...we took the one off of Boonville thinking it was a shortcut, but meandered around until we finally got to the back of the park where our group was. We ran a mile doing this funky loop, plus our 3.1, plus the mile warm up walk, plus a good third of a mile walking that I didn't track on my Garmin. Needless to say, my legs were a little tired after all of this! One of the things CC suggested I try doing was to run at a specific pace for one mile, then take a five minute rest break, then do it again. 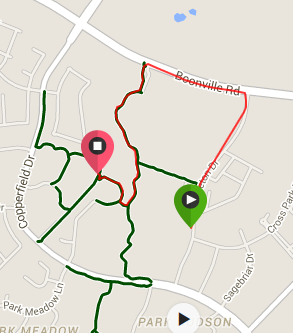 On Monday, Jeff and I tried this - I set my Garmin to beep at me if I ran slower than a 12:50/mile pace. It beeped about 4 or 5 times during the first mile, which I expected - I'm very slow to get started. I hit one mile and paused my Garmin so we could do our rest break - I'm not sure how long we took, but we walked about two-tenths of a mile. Then we started on mile two, and my Garmin only beeped at me twice, near the end of that run. Now, I couldn't talk while I was running, and my breathing was all over the place during that first mile. But color me shocked when I got home and uploaded my Garmin so I could see my stats: Mile one was came in at 12:08, and mile two was at 11:46! WHAT THE HELL??? Seriously, I do not understand my running at all. So annoying for you the anxiety, hope you will get over it one day. And yes you are perfectly capable to run a 5K without stopping, I'm also sure about that. I know the way in my town very well but back in the days when I was training for a half and had to run longer distances I mapped them out and sometimes drove it first if I hadn't been in that particular part. Great idea about running a mile under a certain pace! It's interesting that you begin to panic when you can't see the mileage - almost as if your brain is ready to kick in, say at 2 miles, to tell you you are unable to run anymore. It's almost like your brain is attached to that screen or something. How about not wearing your Garmin at all? Just forget about your pace/time/mileage and get out there and run. Let someone else do the tracking part if you're trying to get to a specific distance. You might surprise yourself. I'm so sorry this keeps happening to you. The weird thing is that I was relying on Jeff and CC for the distance, and in a way, that seemed to bother me more, not knowing how far (or how much farther) I'd gone. Gah. I just don't understand. That is very cool about the deer. We have lots of deer around here, but I"ve never been close to them running like that. Its more like hearing them bound away through the forest. The ones that are close enough to see usually just stop chewing for a minute to stare at me. That is so cool about the deer. We come upon them sometimes on the bike path and it is sooo neat. Maybe you could try some meditation/hypnosis for the anxiety? Might be worth a shot at any rate. Speedy gonzales! Love it! That's probably why I don't like to run long distances, too much time to think about stuff! I had the same thought as Lori - meditation or self-hypnosis might get you past the mental block and stress. Ack lost comment - sorry if this duplicates! First off congrats on the speedy mile. Secondly, I totally get what you mean about your brain getting in the way. So many times, I know my body can push farther but something in my mind just panics at the idea and I stop to walk even though I probably didn't need to. Good for you for tackling the mile repeats as a way to work on it! Good luck!